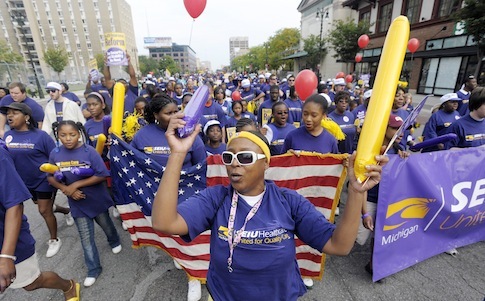 The Service Employees International Union will have to pay the second-highest fine in Michigan history for its failed 2012 campaign to preserve forced union dues among home care workers. Michigan Secretary of State Ruth Johnson said that the politically powerful union agreed to pay the state nearly $200,000 for failing to properly disclose donors and file timely campaign reports. The union funneled more than $9 million into two 501(c)(4) non-profit groups, Home Care First Inc. and Citizens for Affordable Quality Home Care, which served as the public face of a ballot initiative. "These organizations cannot be used as a means to conceal the identity of the true contributors," Johnson said in a release. "This agreement reflects our commitment to transparency and accountability in the campaign finance process, especially in an election year." The union could have faced millions of dollars in fines if it did not settle with the Secretary of State’s office. SEIU said in a statement that reporting oversights were inadvertent. "We have decided not to dispute the preliminary findings of the Secretary of State and SEIU Michigan consider this matter closed," the union said. "The mistakes were a result of errors and reports by the Citizens for Affordable Quality Home Care regarding the receipt and transfer of funds." The fine stemmed from an August 2013 complaint filed with the Secretary of State’s office. It alleged that the union and its 501(c)(4) groups misreported its campaign disclosures. For example, SEIU reported more than $4 million in direct contributions to the 501(c)(4)s in September filings, but those contributions were later scrubbed from an October campaign report, according to the Secretary of State’s complaint. Patrick Wright, a senior legal analyst with the free market Mackinac Center for Public Policy, said the fine was an appropriate conclusion for an election battle "that started off ugly and ended ugly." The SEIU earned about $6 million per year from the forced dues program established by former Democratic Gov. Jennifer Granholm. It was willing to spend big money to preserve it, according to Wright. "They were willingly bend the rules to set the scheme up in first place, so their attempts to continue it through questionable campaign finance is in no way a shock," he said. "Clearly it was a major income source and they were loathe to let it go." The fine is the second highest campaign finance violation in Michigan history. Former Democratic congressman Mark Schauer was forced to pay the state more than $225,000 for taking excessive contributions from his state Senate campaign fund in 2009. Schauer is now running for Michigan governor. Wright said that the large amount indicates that the union recognized the state had powerful evidence of campaign malfeasance. "They seem to be clearly admitting fault. The amount of money seems to indicate that the culpability was rather clear and that they’re hoping this will go away," he said. This entry was posted in Issues and tagged SEIU, Unions. Bookmark the permalink.